Sunset Overdrive: Fun Trumps Realism? 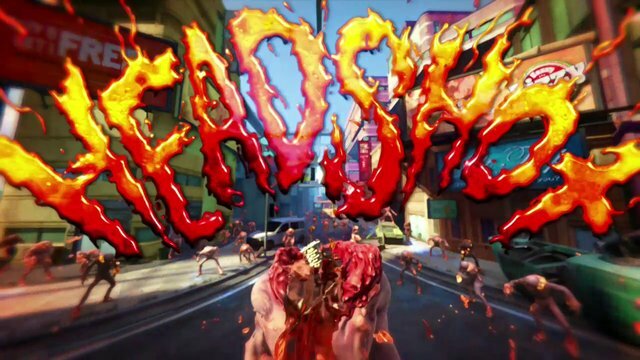 Another big title from E3 this year is Sunset Overdrive. I have so much to say about this game so strap yourself in, I may even have to make a part 2 to this post but let’s get on with the show. The “Fun trumps Realism” quoted by Jon Paquette (lead writer of the game) really stood out to me and I’ll expand on this before going into the obvious stuff about Sunset Overdrive. I think this is a true statement because many of us play video games to escape our lives just like in Sunset Overdrive. The point with video games is someone who took their own laws of physics, world, cities that were built from scratch and wrote a story that no one else told. That is what makes all of us pee in our pants at the new release trailers, faint when we see someone cosplay our favorite characters, spend our time and money to express how big of a fan we are to the game. So to see this incorporated into Sunset Overdrive makes me really happy. Nonetheless, yes we have really enjoyed how real games are becoming i.e AI programming, graphics etc etc. But if realism is what we want then why is it we still feel the excitement when seeing games that make no sense to the world we already live in day in and day out? Because it’s fun, because it still shows that there are people out there who still held onto their crazy imagination and wanted to share it with us to enjoy and interact in. So me personally it makes sense to bring back games being fun than realistic. When does Sunset Overdrive Come Out? October 28th for USA and potentiall October 31st for the UK. Since people seem to be getting hit with nostalgic feelings over this game I’ll chime on it too. Sunset Overdrive felt like a Jet Force Gemini meets Viewtiful Joe meets Sonic who got soap shoes for the first time on Sonic Adventure 2 in a open world like Infamous. I say Jet Force Gemini because even if your aim was bad as long as you destroyed whatever you were aiming at mission accomplished. Either it was a rocket launcher or emptied entire clips in your machine gun. Whatever it takes, you kill em all wondering how such a gory game didn’t get your characters’ clothes dirty. I say Viewtiful Joe because obviously you’re about to own everyone like a boss but you had to do it in style and the animations used to feature bosses or show how much of a smack down you laid on everyone was even spelled out for you. Which I saw very obviously in Sunset Overdrive. I say Sonic because the grinding on rails pretty much was the needed reinvention to compete with Mario and also put into motion many kids wanting soap shoes. And it seems soap shoes may come back into style in the very near future. And the first game that came to mind was Infamous when I saw all of the open world at your disposal where everyone is out to get you. Shoot just me saying that gives me the idea that Sunset Overdrive is how you wish your dreams turned out when you have nightmares of people or things chasing you. 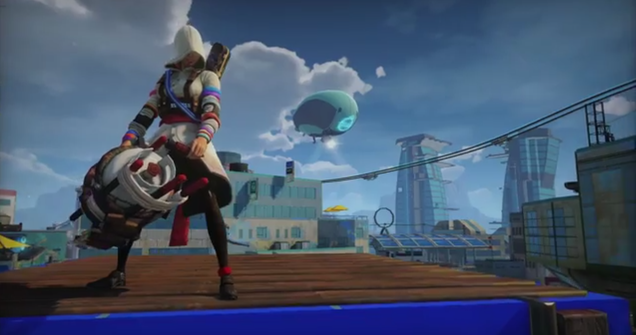 Even though this game hasn’t come out yet I’m already looking forward to how the gaming community will rate Sunset Overdrive’s online co-op versus Assassin’s Creed Unity co-op.